Villa Ful is located Kalamar area which is one of the best area in Kalkan/Turkey. Villa Ful is 4 bedrooms all situated with en-suite bathrooms. All room has stunning sea views. Villa is only 100 meters walking away from the sea. There is a Kalamar beach clubs and Kulube hotel beach clubs just 5 minutes walking.The villa is modern, and designed with luxury in mind. Villa is suitable for family and friends of group. As you would expect, the villa is equipped to a very high standard, and is air conditioned throughout, and has beautiful travertine marble flooring. Villa has beautiful sun terrace which is you will love it. There are sun loungers, sunbathing area, private garden, private infinity swimming pool, BBQ, sunshade, outside shower and armchairs which are perfect for relaxing by the pool area during the day and during the night. Infinity pool dimensions is 9m. X 4m, Dept. is 1.50m. Bedroom 1 is double bedroom with an en-suite. There are vanity unit, wardrobe, air-con, nightstand, and there is a access to the front balcony as well. Room has amazing sea views. Bedroom 2 is Twin Bedroom with an En-suite, Fitted wardrobe, Air-Con, Vanity unit, Nightstand and there is a access to the front balcony. Room has fantastic sea views. Kalkan has a small but pleasant beach only a few minutes' walk from Villa Ful. 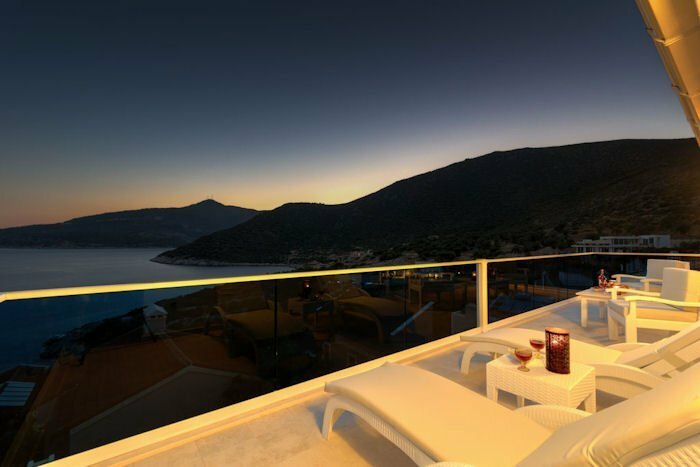 Or, on the Western side of Kalkan, is Kalamar beach, which has a beach club and a couple of waterside restaurants to choose from. The beach at Patara is also within easy reach, heading further west from Kalkan. Part of the national park, Patara beach has beautiful white sand and an array of wildlife, including turtles.